I learned my shepherding skills in Germany, tending sheep on public land, often part of landscape care. The grass always had to be grazed short. It had to be “cleaned up”. It was a requirement by those who wrote out the leases who were primarily concerned with a certain look or protected or endangered plants or insects or butterflies. Succession, meaning bushes and trees taking over and closing up the open landscape, was a concern as well. Maximizing tonnage per acre for grazing was not a concern. Grazing something “clean” was with me for a long time and was perhaps the single biggest mistake I initially made in my rotational grazing program. Residual forage, “the living plant material left behind after grazing’” as Jim Gerrish defines it, is of outmost importance for many different reasons. Here is why. Green plants need energy to grow. They can get that energy in two different ways: through photosynthesis and through accessing stored energy in their roots. Photosynthesis is quicker while metabolizing energy from the roots is slower and harder on the plant. Photosynthesis is also pretty much a “free lunch” for the plant, a free lunch provided by the sun. So it’s simple logic. 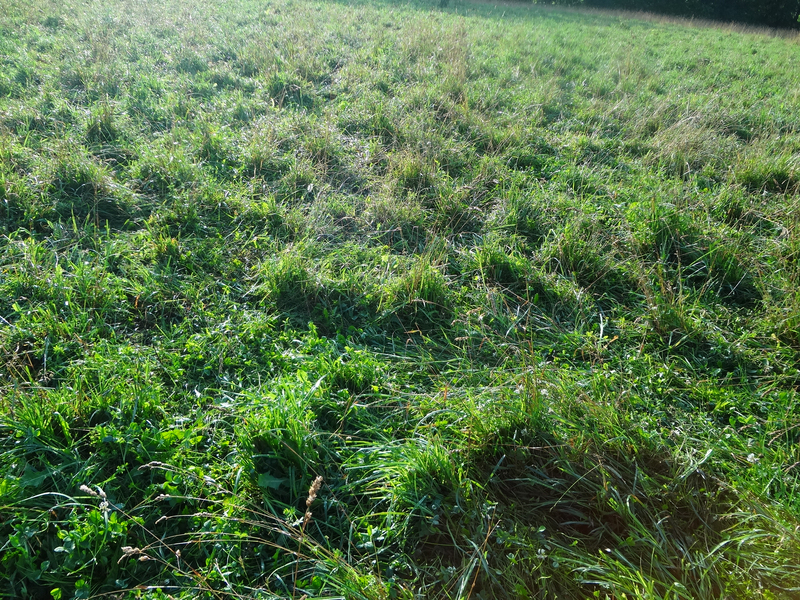 If you have plenty of green leaves left after grazing, the plant can regrow quicker. It can use its “solar panels” (Jim Gerrish). If you are a good observer you may find that fact rather obvious when you look at pasture of yours that you grazed shorter and pasture that you left with enough residual. The difference is so startling that the naked eye can see it. This should be reason enough to not graze short. However, residual is good for other reasons as well. Picture a plant above and below the soil. Whatever length the plant has above the soil it also has as the same length of the root below the soil. To whatever size you graze the plant down, the root will die off to the same length below the surface. That means the shorter you graze, the shorter the roots will be. Roots that are too short weaken the plant. Many of us, especially those who have sheep or goats, often graze their animals on slopes and hills. You probably have all seen what a nice downpour can do to the soil if you’ve watched the rain hitting a field that just has been plowed. The water runs off and is not caught. With it, it takes a good amount of fertile soil. Residual has the opposite effect. First, there will be no erosion. Secondly, it catches most if not all of the water. Want proof? Stand once during such a deluge at the bottom of a slope or hill with pasture that has plenty of green forage and watch for the run off. You will find very little if any. Then compare the same with pasture that has been grazed short. This catching ability is particularly helpful during a dry spell when you get a short and heavy thunder shower once in a while, yielding perhaps two or three tenths of an inch of rain in 10 minutes time. With enough residual the pasture will have the benefit of all of that water. Residual also moderates soil temperature on hot days and therefore significantly slows down the heating up and drying out process. A canopy of forage does the same as a straw hat does to your head: it keeps it relatively cool. Microbes are important for the dynamics of a healthy soil and plant life. Microbes will also break down manure and will make the nutrients available quicker. Short-grazed pasture doesn’t provide much of a habitat for microbes. It will be too hot and dry in the midst of summer for microbes to thrive. One argument in favor of short grazing that I come across on occasion is the fact that internal parasites (meaning worms or more precisely the infective larvae of internal worms) do not survive very long in very short pasture when it is hot and dry. That is true. However, how do you get to a short pasture in order to clean it from worms? By grazing, right? And if you do, you will first let your livestock take in all larvae that are there. Remember, most of your infective larvae sits on the first four inches from the ground up and only few crawl higher. So how about not letting your livestock take in most of these worms in the first place by leaving residual? So what is just the right height for residual? I’d say about four inches, for sure not less. Depending on what you graze, this is not always an easy task. Some plants are more desirable than others by my kind of livestock, which are sheep. White clover and rye grass are taken down in no time to four inches or less (if I let them) while orchard grass and fescue are not as likely to be grazed down that low. If in doubt, move on and graze the next cell. While you get the most out of each plant being digested when it goes through an animal, any residual left behind is not truly “wasted” because it still is part of the circle of life and may feed the soil or microbes or will be part of re-growing the new plant. Ulf owns and operates White Clover Sheep Farm and breeds and raises grass-fed White Dorper Sheep without any grain feeding and offers breeding stock suitable for grazing. He is a native of Germany and has lived in the US since 1995. He farms in the Finger Lakes area in upstate New York. His website address is www.whitecloversheepfarm.com. He can be reached by e-mail at ulf@whitecloversheepfarm.com or by phone at 585-554-3313.